FOR YOUR COMMERCIAL BUILDING OR PRIVATE PROPERTY TO HAVE ALL YEAR ROUND, EFFICIENT, TOTAL CLIMATE CONTROL WITH A CLEAR ENVIRONMENTAL CONSCIENCE LOOK NO FURTHER THAN THE VARIABLE REFRIGERANT FLOW (VRF) ALSO KNOWN AS THE VARIABLE REFRIGERANT VOLUME (VRV) SYSTEM. 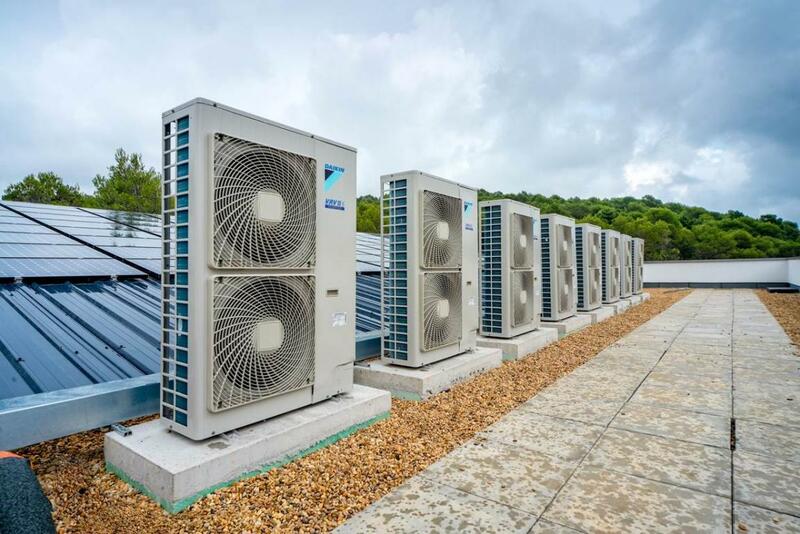 Variable Refrigerant Flow (VRF) or Variable Refrigerant Volume (VRV) air conditioning systems are an extremely energy efficient means of precisely regulating the temperature within commercial buildings. More often than not, the rooms or zones within the building will need to operate at differing temperatures. The cooling and heating requirements of these spaces inevitably change throughout the day, typically as a result of varying occupancy, heat emitting office equipment and lighting, changes in outdoor temperature and notably, the position of the sun. The combined effect of these internal and external influences often means that some areas of the building require cooling, while simultaneously, other areas require heating to maintain a constant and comfortable internal environment. 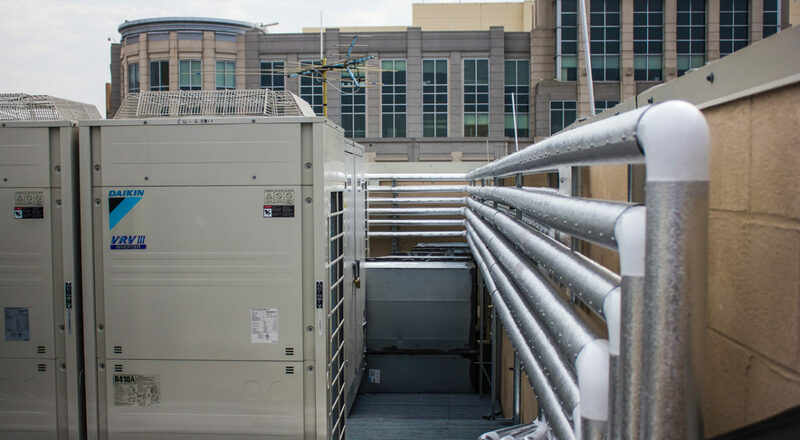 A well-designed VRF/VRV system will typically serve areas known to have opposing heating and cooling loads and can, therefore, redistribute excess heat from areas that require cooling to those that require heating. Heat recovery VRF/VRV systems deliver the ultimate in energy efficiency, achieving a SCOPE/SEER in excess of 5.0. 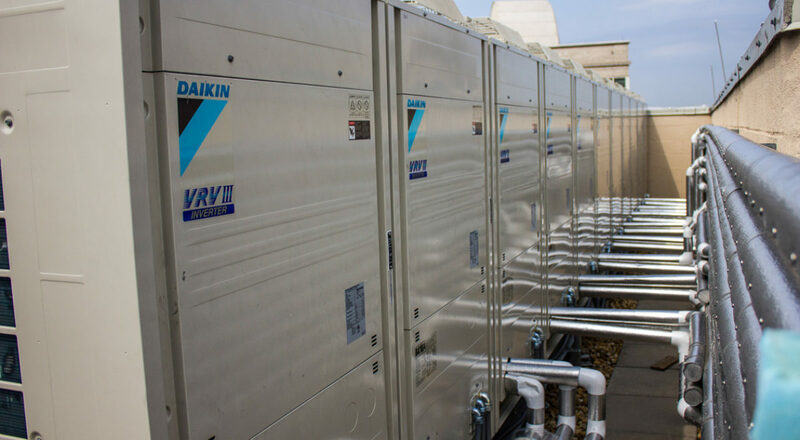 In its simplest form a single VRF/VRV outdoor unit serves multiple indoor units, which are connected to it via a system of copper pipework containing refrigerant. VRF/VRV technology achieves extremely high efficiencies by varying the flow of refrigerant to the indoor units based on the exact demands of the individual areas. This allows for precise temperature control and resulting zoned comfort. VRF/VRV air conditioning systems also benefit from being flexible and modular in design. Multiple outdoor units can be joined together to increase the overall system capacity and, therefore, increase the possibility of heat recovery. Indoor units come in multiple types and sizes making them suitable for most applications. Systems can also be engineered to minimise or even totally remove the requirement for air distribution ductwork, making them cost effective to implement and easier to install where there is limited space.